This paper analyses the text recorded by Strabo, as attributable to Eratosthenes’ and Hipparchus, and concludes that there has been a misinterpretation by Strabo of the details. The prime example of misinterpretation is the length of the oikoumene, the longitudinal measure. This, when coupled with his non cross- referencing to supplementary statements of measure, particularly the statements that lines are wobbly or aslant, indicates a misquoting or miscomprehension of the data. When plotted, the shape of these lines leads to only one conclusion, that Eratosthenes did not draw proper latitudinal and longitudinal / meridional lines upon his world map. Strabo in his text does however appear to use the 157.5 metre stadion. The research is within two sections, the Length or longitude and Breadth or latitude of the oikoumene. Eratosthenes’ of Cyrene, c285-194BCE1, accepted the invitation of Ptolemy III Euergetes to become royal tutor and to succeed Apollonius Rhodius as head of the Great Library at Alexandria. He was an eminent mathematician and geometrician and was accepted by his peers as an equal to Archimedes. His works include, ‘On Geometrical Means; on the Duplication of the Cube; on the Measurement of the Earth and, Geographia’. There were also books on philosophy and poetry. Thus, we may conclude Eratosthenes was rigorous in his research and would ensure the correctness of his distance-measures and use a mathematical basis for that research. Hipparchus of Nicaea2 was an astronomer who flourished in the second half of the second century BCE, and thus had only the written works of Eratosthenes to aid his deliberations. He was an eminent astronomer, systematic and careful, inventing several astronomical instruments. His geographical treatise, a polemic against the ‘Geography of Eratosthenes,’ is known mostly from Strabo’s text. But when the recorded text is analysed, it is less a ‘polemic against’ and more an ‘adjustment of distance- measures’, bringing conflicting data to bear on the subject. He was the instigator in Greek cartography of the 360 degree subdivision of the world globe, and had agreed with Eratosthenes that the world measure was 252 000 stadia. Strabo of Amaseia3 was born c64/63BCE and by 44BCE was in Rome. From c25 to 20BCE he was in Alexandria. His ‘Geographia4’ was written between 9 and 5 BCE, with revisions in AD18-19. Thus we can surmise that the information for his seventeen books of ‘Geographia’ was obtained from other treatises in the Great Library. Therefore, the information used is mainly second or third hand, and he has no basis for criticising distance-measures, other than those of his personal journey from Amaseia to Alexandria. He has been considered amateurish by scholars who have studied his text concerning mathematics and cosmology by preferring the practical to the theoretical. But, in recording these details, which had he not it is doubtful we would have so much historical knowledge, we must acknowledge the ‘Geographia’ as an extra-ordinary achievement. It is therefore prudent to analyse the text of Strabo without allowing the major attention grabbing distance-measures to cloud our judgement, and to look for the nuances contained in the whole text, all seventeen books, to explain the so obvious contradictions. Many researchers have used the text of Strabo4, Book 1, chapter 4, to discuss the knowledge of Eratosthenes and thus the extent of the known world or oikoumene. ‘1.4.2’: breadth of world, 38 000 stadia, i.e. North/South. This statement indicates that there was no definite point with which to delineate those extremities, and we must look to the geography there. This statement is perhaps the crux of the mis-understandings within the research of previous papers. It should not be read as meaning- ‘that which follows is that reckoning’-, it merely refers to the original calculation, which is actually nowhere fully explained in the text. This places them on or about the same latitude, c16N to c17N. This is an accurate measurement, 16.96N to 38N = 14728 stadia. This is a definitive statement for it leads to the conclusion that there were few if any actual parallels or latitudinal lines actually used as the next statements confirm. From the above text we can establish that the lines indicated and described by Strabo are definitely not true geographical graticules, but rather methods of establishing basic distance-measures and relative distances. As stated, we must use the whole text of Strabo, each distance-measure given, and build a picture of those relationships which are severally given for most major geographical distances. To focus upon Book 1, chapter 4, paragraphs 2 and 5 will give a completely misleading view of Eratosthenes ‘work. It is quite possible to surmise that a conflation by Strabo, of Eratosthenes’ original Book 2 details, has led to the many mis-interpretations in print today. “The perimeter of the earth is 252 000 stadia, as Eratosthenes, who investigated this question more accurately than others has shown in the book he wrote ‘On the Measurement of the Earth’ ”. The length of the stadion is more problematical. In the texts of many authors6 it has been discussed and quantified to various lengths, but Aubrey Diller7 pointed out the link to Pliny8 and the derivation via the Schoenus7 at 157.5 metres. That is the measurement used in this text to compare Strabo’s quoted stadia lengths to actual or geographical distance-measures. It is also possible that Eratosthenes’ second book was akin to a synopsis or résumé of the information further explained in his third book. This could account for the at times, disjointed presentation within Strabo’s text, of information which should really be aligned. We must also be aware that this information has already been synthesized to provide a flowing text. In ‘2.5.9’ we read,” Its length, however, is estimated at about 70 000 stadia: and this is, from west to east, the distance from the capes of Iberia to the capes of India, measured partly by land journeys and partly by sea-voyages”. Thus we lose 3 800 stadia (see 1.4.5 above) by a simple comment, but gain confirmation of the methods of measurement utilized. They are sea and land itineraries. But, why should Strabo make such a statement, he knows the reality. Eratosthenes’ third book is discussed by Strabo in Book 2 chapter 1. There, in 41 paragraphs is a veritable compendium. 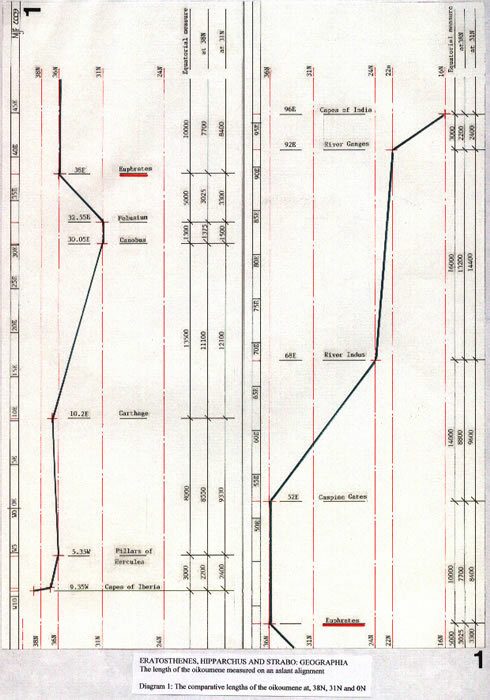 The most important details being not only those previously indicated, but, that which is clearly stated in ‘2.1.1’, that the east/west line was not a parallel but a wobbly line across the globe. If we commence in the west, the capes of Iberia (note plural) are at 37N; the mouth of the Nile at 31N; the Indus at 24N and the capes of India (note plural) at 16N, the product of which is an alignment, overall akin to the plane of the ecliptic, and is somewhat contrary to the parallels and meridians mentioned in the text. The original comment in ‘1.4.6’ which states that the ‘said reckoning of the stadia from India to Iberia’, was made on the parallel of Athens, at c38N is also one which is perhaps, as this parallel is hardly mentioned in the text for any actual measurements, a mis-understanding or mis-representation. But before that can be explained it is necessary to investigate the basic reckoning of Eratosthenes, who was, after all, an accomplished mathematician. He has decided to use sixtieths as the divisor, being fully aware of the Mesopotamian sexagesimals9, and thus with a world of 252 000 stadia, each 1/60th would be 4 200 stadia. 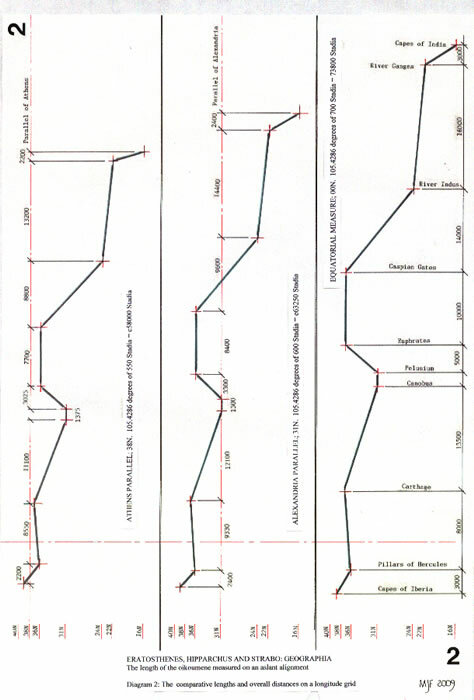 However, it is the latitudinal circle measurement of each parallel which is important, so that itinerary measures when converted to sixtieths on any latitude could be reconverted to an actual measure on any other. To achieve that, we must look for a divisor capable of determining their individual lengths. Eratosthenes’ states, that the parallel of Athens is less than 200 000 stadia. But, he required conceiving a ratio equivalent to the cosine of the actual latitude (c38N) to calculate that figure. That necessity for a ratio applies equally to all parallels. If Eratosthenes had simply reversed the two figures, 1/60 and 4200 and then used as a divisor, 42, the length of the major parallels he has chosen will reduce from the equatorial measure by 6 000 stadia, i.e. 90/42= 2.14286 degrees or 15/7 degrees, the equivalent of 6000 stadia. Thus, each major parallel he uses for his distance-measures is simply rationalised. Thus each of Eratosthenes’ reckonings can be made with ease on the parallel chosen, by dividing the length of circle into 60, or 360 parts for a single degree of longitude, and when it is necessary to move across parallels, adjustments are easily made, and the length of each 1/60th or 1/360th easily determined. Note: most degrees given are quoted at two decimal places only. Although Eratosthenes’, or Strabo, lists the length of the oikoumene from the east, the capes of India, to Iberia in the west, it will simplify the comparative research to reverse the list and use the geographical terminology of degrees from Greenwich. Thus Iberia, Cape de Roc and Cape St Vincent, 9.35W & 9.00 W, to the Capes of India (96.08E), is a total of 105.43 degrees geographical which is the equivalent of Eratosthenes’ given length of 73 800 stadia. And here we see serendipity playing its usual role. If we calculate 105.43 degrees as Eratosthenes’ equatorial measure, i.e. 105.43 x 700 stadia, we have precisely 73 800 stadia. However, Eratosthenes’ line of measure commences at 37/36 N, and is then aslant. Strabo also clearly states in ‘2.1.35’ that Eratosthenes is fully aware that there is a difference in latitude between the parallels of Athens and Rhodes. Therefore, the text concerning the parallel of Athens, and an east/west alignment from the ‘Pillars to Issus,’ and thence to India, should be considered confused and unacceptable. We must examine individually the sections of Eratosthenes’ line to establish how the final distance-measure was arrived at, and what the repercussions are for the overall length of the oikoumene. 1) Capes of Iberia (plural) to the Pillars of Hercules; 9.35W to 5.35W, or 4 degrees Geographical. Eratosthenes, 3 000 stadia; Geog. distance, 2280 stadia, and at Athens parallel = 2200 stadia. The distance measure at the equator would be 2800 stadia, but, given the authors propensity for rounding out figures we may assume that the 3 000 is possibly correct. The plural of cape is quite significant, both here in the west and at the east end of the alignment. It signifies a multiple and is not a mere figure of speech or text. 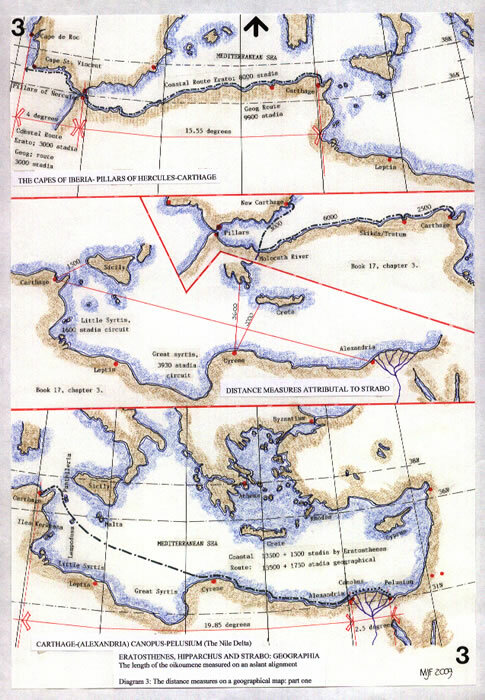 2) Pillars of Hercules to Carthage; 5.35W to 10.2E or 15.55 degrees Geographical. Eratosthenes, 8 000 stadia; Geog. Distance, 8866; at Athens parallel= 8550 stadia. This is not an entirely accurate measure, which at the equator would be 10385 stadia. But, as 2280 + 8866 = 11146, and 3000 + 8000 = 11000 stadia, it is quite accurate. 3) Carthage to Canobic Mouth of Nile; 10.2E to 30.05E or 19.85 degrees Geog. Eratosthenes, 13500 stadia; Geog. Distance, 12400;at Athens parallel =11000 stadia. There is of course the difference in latitudes to account for between 38N and 31N. In ‘2.1.40’ the distance-measure between Alexandria and Carthage is given as 9000 stadia. It is therefore plausible to accept this alignment includes an element of measure by water, sailing south from Sfax and the Iles Kerkonna, prior to crossing the Great Syrtis (Surt) to Banghazi and then to Alexandria. The southerly distance is Carthage to Cyrene, geographically 37N to 33N, some 2800 stadia. Thus, the stated distance is quite plausible as the diagram 3 illustrates. But in ‘2.5.38&39’ we deduce that Carthage to Cyrene is only 900 stadia, (an obvious mistake),and thus Carthage to Canobus would be 21 degrees of 600 stadia; (i.e. the degree length at 31N), and is therefore in total 12600 stadia. However, this is also a reasonable estimate. 4) The Canobic Mouth to Pelusium; 30.05E to 32.55E or 2.5 degrees Geographical. The distance-measure of 1300 stadia is quoted three times by Strabo. The second instance in ‘17.1.6’ is given as the sea distance across the Delta, which it manifestly is not. The direct geographical distance is 1500 stadia, with a sea distance of 1750/1850 stadia dependant upon a direct or shore hugging route. Thus 2.5 degrees at the equator is 1750 stadia, and the quoted sea measure of 1300 stadia would only be correct at latitude 42N. At 31N, 1300 stadia equal 2.167 degrees and is actually the distance of the Bolbitine mouth of the Nile from Pelusium. The Canobic mouth, as stated by Strabo, is c150 stadia distant from Alexandria, and the Bolbitine mouth is c220 stadia. The c220 stadia would appear to be a sacrificial measure in the rounding out of distance-measures we find in Strabo’s text! Therefore, why did Eratosthenes introduce this measurement? Is it necessary to obtain a total measure of 73 800 stadia? 5) Pelusium to the Euphrates; 32.55E to 38E, 5.45 degrees geog, but 31N to 36N. Eratosthenes, 5000 stadia: Geog. distance 3084 stadia at 36N, or 3270 stadia at 31N. The elbow in the River Euphrates at 36N, is on the Pillars alignment, and is at 38E. But the start point is at 31N. An itinerary route would pass through Jerusalem and Amman before arriving at the Euphrates. This route is quite accurate at 5000 stadia, but is actually 2000 stadia less for the world measure longitudinal distance. 6) Euphrates to Caspian Gates; 38E to 52E at 36N; 14 degrees Geographical. Eratosthenes; 10 000 stadia; Geog distance 8000 stadia. (‘2.1.3’ also refers). This is an itinerary route and the distance measure is documented at ‘2.1.24’ as now quoted: “Now Eratosthenes says that it is only thus, ‘in a rough outline way’ that he has read the third section, with its length of 10 000 stadia from the Caspian Gates to the Euphrates”. It is in fact, from the Euphrates to the Tigris, to Arbela, to Ecbatana, thence the Caspian Gates. This is a sinuous journey north-east, south-east, north-east from 38E to 52E, moving one degree north and two degrees south to achieve the route. By simple trigonometry it is 9300 stadia and thus the 10 000 stadia may be considered a correct itinerary distance. 6A) Prior to departing section 6 of the world distance-measure, we must investigate the other local distances quoted in Strabo’s text ‘2.1.34 to 39’. Referring to the various diagrams, 2 to 6 inclusive, the distances from Babylon are indicated, which link to the Caspian Gates and River Indus, both points within Eratosthenes’ world measure. These distances are itinerary measures and accord with the Euphrates to Caspian Gates distance, and indicate an error of over measure in the 10 000 stadia quoted. They also provide us with the key to resolving the overall Caspian Gates to River Indus measure of 14 000 stadia. 7) Caspian Gates to River Indus, 52E to 68E, but also 36N to 24N. This distance quoted from Eratosthenes’, 14 000 stadia, comprises an itinerary measure, which is actually from the Caspian Gates southerly to Persopolis, and thence south-easterly to the mouth of the Indus. The first part is c4200 stadia, followed by c10 000 stadia to the Indus. Thus we may deduce that the true east/west measure is 16° x 700 or 11200 stadia measured at the equator and 9000 stadia at 36N, or 10200 stadia at 24N. But there, in the text of Strabo, is a singular piece of accurate measure no doubt provided by those itinerants who traversed the southern regions of Persia. Book ‘2.1.23’ discusses the distances from Babylon to Susa and the Frontier of Persis and Carmania, on ‘a measured highway’. 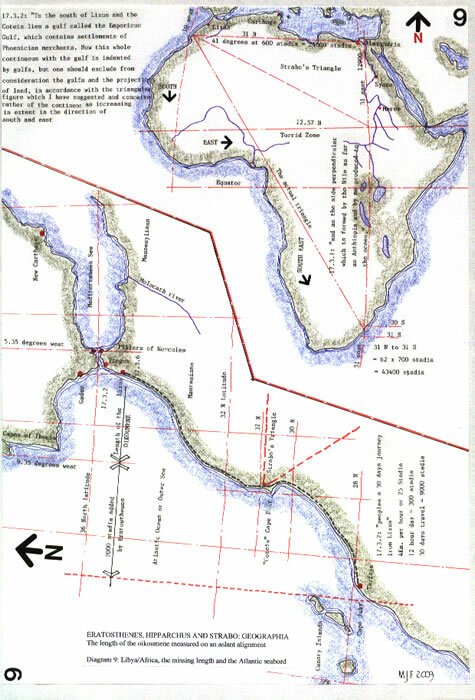 The end point of this traverse after the 9000 stadia quoted is quite precisely the boundary between the Kerman and Sistan provinces of Iran on the northern fringe of the marsh lake at 28N, 58.75E. This boundary aligns with the ancient frontier. Where-as the overall may be suspect, some detail is quite accurate. Eratosthenes measure is 16 000 stadia plus 3000 stadia, but the measures are stated in ‘2.1.7’ as itinerary measures. 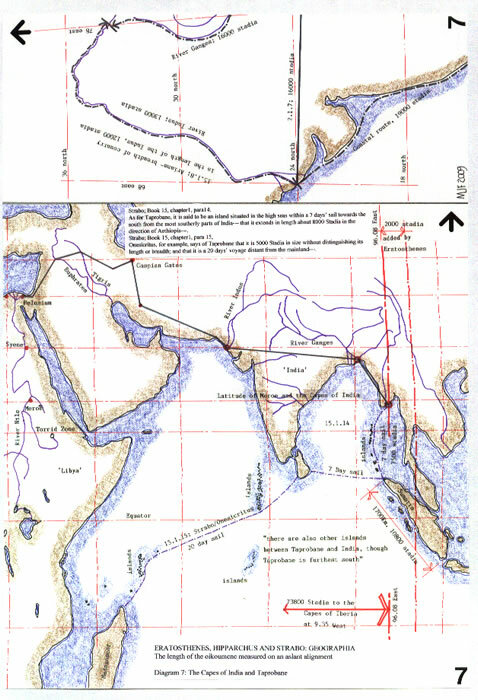 The “narrowest” part of India, from the River Indus at 24N, is actually to the River Ganges at 22N, i.e. 68E to 92E, simply put Karachi to Calcutta. At 24N the geographical distance is 15 450 stadia. The deviation from the straight line would be around the Rann of Kutch and south to the Tropic of Cancer, then due east to the Ganges Delta. This section is discussed later at some length. The first cape area east of the Gangetic plain is south by 6 degrees to the Maudin Sun, Erawadi Delta, which forms a large cape extending from c92E to c96E and is thus a distance of some 2700 stadia east at 16N. There are no other capes applicable, the next being the end of the Malaysian peninsula at Singapore. The latitude is also that of Meroë as stated by Strabo in ‘2.1.2’. But this must be discussed now in detail. India is described as rhomboidal, and the text appears to indicate the breadth, i.e. latitudinal measure, being larger than the length or longitudinal measure. This is of course geographical fact, but not as it has been portrayed subsequently. In 2.1.22, Strabo endeavours to describe India utilising Eratosthenes’ method of subdivision of the oikoumene. I quote, ‘And so, after calling India Section First of the Southern Division, and Ariana Section Second, since they had contours easy to sketch, he was able to represent not only length and breadth of both sections, but, after a fashion, shape also, as would a geometrician. In the first place, India, he says, is rhomboidal, because, of its four sides, two are washed by seas (the southern and eastern seas) which form shores without very deep gulfs; and because the remaining sides [are marked], one by the mountain and the other by the river, and because on these two sides, also, the rectilinear figure is fairly well preserved. Secondly, Ariana. Although he sees that it has at least three sides well-suited to the formation of the figure of a parallelogram, and although he cannot mark off the western side by mathematical points, on account of the fact that the tribes there alternate with one another, yet he represents that side by a sort of line that begins at the Caspian Gates and ends at the capes of Carmania that are next to the Persian Gulf. Accordingly, he calls this side “western” and the side along the Indus “eastern”, but he does not call them parallel; neither does he call the other two sides parallel, namely, the one marked by the mountain, and the one marked by the sea, but he merely calls them “the northern” and “the southern” sides. We also read in ’15.1.13’ concerning the River Indus-‘they all flow firstly towards the south and then continue to flow in the same direction in particular those which flow into the Indus’ and’ but the Indus empties by two mouths into the southern Sea’, Therefore the River Indus, as diagram 5 illustrates is the western boundary of India, rising in the Caucasus and has basically a southerly route. That is not to say its course is due south, as can be read in previous interpretations11. The geographical route can be described as 23 degrees west of south from its northernmost point at Sazin, Peshawar. That is towards the south or southerly. If we use this alignment,” towards the south” and plot the rhomboid using the breadth, from the Indus to the Ganges, and the other given measures, a very different picture emerges. 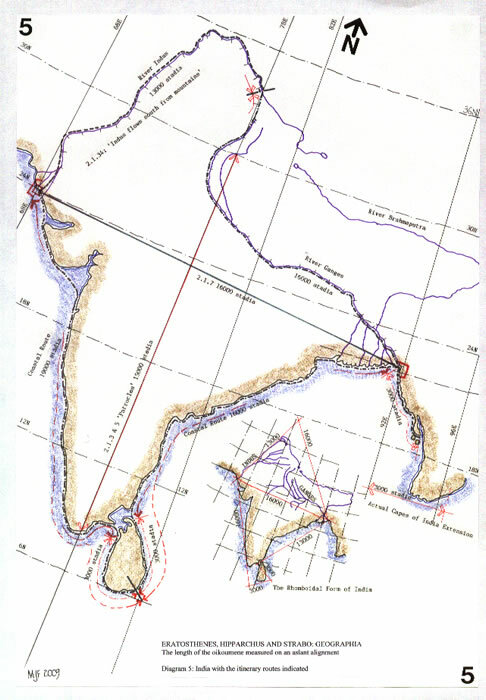 By utilising each measure as actually described, as an itinerary measure, and plotting the coastal routes, a picture emerges which illustrates India, and that its proper shape and size was well known. Diagram 5 illustrates the narrative which follows. This new reconstruction also concludes that the island of Sri Lanka, Taprobane, was in fact considered part of Southern India. The sea-going itinerary measures indicate that the extra 3000 stadia precisely as the coast-line of Sri Lanka. It also indicates that the Caucasus Mountains and the Indus River are at 36N, as Strabo’s text describes. The original descriptions of south and east have been mis-interpreted, thus making the length (longitude) into the breadth (latitude) and therefore misplacing the capes of India. They follow the original breadth measure, which is now an east west length and thus they are east of the Gangetic plain. From 36N, the River Indus flows southerly to the ocean covering a distance of 13 000 stadia. The River Ganges commences its route just south of the River Indus source and flows southerly, then easterly and finally southerly to the ocean at 22N/92E. The itinerary route is 16 000 stadia. From the mouth of the River Indus, the ‘south’ side, as an itinerary route, measures 19 000 stadia to the most southerly point of Sri Lanka. The ‘eastern side’ from the River Ganges is then a matching itinerary route of 16 000 stadia ending at the same point, the south of Sri Lanka. Thus we can show the ancient mariners measured the coast precisely. 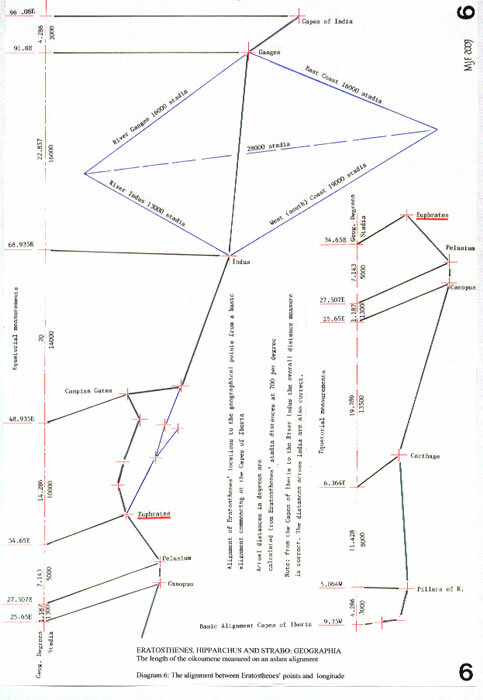 India is not a rhomboidal form with the north and south sides parallel to latitudes, but a rhomboidal form appearing as a diamond, as diagram 6 illustrates, with the capes of India to the east. TAPROBANE, WHICH ISLAND IS IT? In 2.1.14, Strabo states: ‘Well, then, let us pass on to the country that rises opposite to the Cinnamon-producing Country and lies toward the East on the same parallel. This is the region about Taprobane. We have strong assurances that Taprobane is a large island in the open, which lies off India to the south. It stretches lengthwise in the direction of Ethiopia for more than five thousand stadia, as they say;—. Now if we assign to this island a breadth that is proportional to its length, and if we add thereto the expanse of the sea between it and India, the sum would be a distance of not less than three thousand stadia – as much as the distance from the border of the inhabited world to Meroë – that is, if the capes of India are to rise opposite Meroë; but it is more plausible to set down still more than three thousand’. If we study the text of Strabo, ‘15.1.14-15’, the island of Taprobane is either eight thousand stadia, or five thousand stadia in length, and a seven day sail or a twenty day sail from southern India. We are told by Strabo, quoting Onesicritus there are other islands between Taprobane and India, “though Taprobane is the furthest south”. The text here is virtually the same as in Pliny8, as is indicated later. The islands of Sumatra and Java are the most likely contenders for Strabo’s Taprobane, as diagram 7 illustrates. Sumatra is 10500 stadia distant from southern India/Sri Lanka and as a twenty day sail it is the equivalent of 525 stadia per day, or normal sailing distance per day for the times10. But, given it is an ocean crossing, although there are Islands in between, it is also a seven day sail with favourable winds. 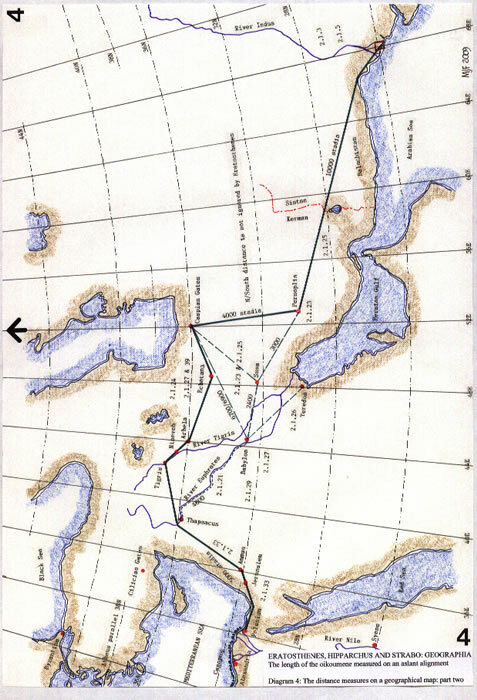 However, if the distance is from the capes of India, as now proposed, it is an easy seven day sail as diagram 7 illustrates. The closest point is at 95E, 5N, but it is 1700Km/10800 stadia in length, but can be said to stretch in the direction of Ethiopia. (The next island, Java is 1000Km/6400 stadia long). However the tip of Sumatra is so very nearly the same easting as “The Capes of India”, i.e. 96E, and thus we begin to see that perhaps a confusion of capes caused the data in Strabo’s ‘Geographia’ to be in error. That is of course if the original error was not that of Eratosthenes’, confused by the same similar information. It is within the text by Pliny8 book, 6.81 that the island of Taprobane is located within the Eastern Sea, ‘and stretches along the side of India from east to west’. He also confirms that it was once thought of as being a twenty day sail, but now has been fixed at seven day sail, ’with reference to that covered by our (Roman) ships’. However, Pliny also states in 6.86-7, ‘The nearest promontory in India is called Coliacus, four days’ sail away – passing, in mid-voyage, the Island of the Sun.’ And, in 6.88 we read, ’The envoys also informed us that the side of Taprobane facing India is (1250 miles or 2011Km, from the translator) 12800 stadia long and lies south-east of India. Thus we may conclude that the Island of Taprobane, which Onesicritus an Admiral in the Navy of Alexander the Great, proved was an Island, is not the same island as is being here discussed. It is in all probability Sumatra. But, could it be that the ‘Island of the Sun’ is in fact the Sri Lanka of today? To complete the aforementioned alignment we must consider Libya, and Strabo’s description. The first, which is to be found in ‘2.5.15’, and given as a minor remark, is followed by that at the end of his text in ’17.3.1 & 2’. Diagrams ES1D08 and ES1D09 have included there-on actual text by Strabo describing the coastline, and should facilitate an understanding of the complexity. But, the basic information indicates that Strabo knew perfectly well that Libya (Africa) was a large land mass, a continent, and that it extended well into the Torrid Zone. He also endeavours to cover that knowledge by insisting that we should –‘exclude from all consideration’– anything which does not agree with the right-angled triangle described in ‘17.3.1’. Except, that he also states,”-overlaps a considerable part of the torrid zone”-, whilst still in other parts of his text trying to insist it should end at the Torrid Zone. Libya when drawn as described, using the whole text, becomes the basic shape of Africa and exposes Strabo to the accusation of curtailing the knowledge to suit his own preconceptions. He actually commences his description with 5000 stadia or c800Kmof the western or Atlantic coast from Coteis (Cape Rhir), at the end of the Atlas Mountains, to the straits of Gibraltar. He does not however comment that the coast must continue southerly, other than with the vague south and east route. It is also pertinent to note that this information is placed at the very end of his ‘Geographia’, Book 17 of 17 and may well have been the ‘last straw’ of a monumental work, and a desire to complete it, as he does, with the Mediterranean coastline. Therefore we can surmise that Eratosthenes’ knew that the 73 800 stadia distance measure was not a true longitudinal measure at any point but the Equator. He also probably knew that if it was reduced to a measure in the region of the Mediterranean Sea, at 31N, obviously it would still be c106 degrees, but only 73800 x Cosine 31 or 63250 of his stadia. The geographical distance, as indicated is 64451 stadia. At the Athens parallel it would be c58200 stadia. The world’s breadth is from 8800 stadia north of the Equator, the Torrid Zone at 12.57N, to the latitude of Thule at 66N, some 53.5 degrees. The basic assumption of a twofold length would be 107 degrees and that is what Eratosthenes’ figures provide for, and he being the astronomer (and philosopher) that he was, would have been almost certain to appreciate this in full. But there is hardly a specific note in the text of Strabo which explains the real longitudinal measures. From the Pillars to Carthage could be measured by both land and sea, as could the onward journey to the River Nile, precisely as Strabo indicates in ’17.3.6’ and ’17.1.14’. But why in setting down the measured points in the most important calculation to be made after establishing the equatorial circle did Eratosthenes’ use some unremarkable places as reference points? Was this in fact a deliberate ploy in order to mask the overall calculation, which in all probability was made on the equatorial line and certainly not on the Athens parallel? Then, was a pro-rata designation of actual places made within the known world which allowed some compatibility? Obviously the Pillars are one point, but the method of stating they are not the furthest point west is quite off-hand. But to use the Canobic mouth of the Nile, which is 150 stadia from Alexandria, as well as introducing the Delta measure of 1300 stadia from Canobus to Pelusium, is bizarre. This is a world measure, to be detailed by point to point distances and the foremost city, Alexandria is relegated to obscurity. The next distance measure is also strange in that it uses a nebulous point, “The Euphrates”, instead of the well known city of Thapsacus (used later) which is close by, and an itinerary route point. Perhaps the next point, the Caspian Gates is acceptable, being a point well established from the itineraries of Alexander the Great, but again unnecessary. From Thapsacus the itinerary route discussed by the text is via Babylon and Persopolis to the Indus, a very direct alignment. But if Eratosthenes’ has measured the oikoumeneat the Equator and is using that length measure of 73 800 stadia, then it was necessary to increase the itinerary route from the direct to the indirect. Hence the line remains at c36N until the maximum north/south distance can be achieved to shorten the overall measure and still achieve c106 degrees. From the Indus to the Ganges the two possible measures are; at 24N, 15 500 stadia and at the Equator, 16800 stadia. Therefore, the 16 000 quoted is accurate and not a breadth measure at all, but a length measure. Thus the conclusions must be that the text in Strabo, Book 1, chapter 4, paragraph 5, is a résumé of following explanatory information and should not be taken as a definitive statement regarding the oikoumene. We must consider the text of Strabo as indicative only of Eratosthenes’ words, particularly as he uses the word ‘declaration’- ‘I will first set down the declarations of Eratosthenes’, but he then paraphrases those words and perhaps creates a very false impression. Then, in trying to move between authors for information, there is confusion, particularly in quoting ’a quote of a quote’ such as Strabo quoting Hipparchus quoting Eratosthenes. But for all that it is a marvellous work of historical importance. The comparable measure by Eratosthenes’, is from the Pillars via Carthage to the Canobic mouth of The Nile, a total of 21 500 stadia, whilst Strabo has 26 900 stadia of coast hugging measure. The apparent error in the first measure is in fact anomalous because as stated, Strabo has commenced his measure on the west coast of Libya/Africa and not as he perhaps intended at Cape Spartel/Ampelusium Prom. This would of course, if we were to remove those 5000 stadia, give similar figures. This also indicates that Strabo must still be using the 157.5 metre stadion of Eratosthenes’. If, what is considered the Greek stadion12 of 185 metres had been utilised, not one measure in the comparison of itinerary distance measures would have produced an acceptable coincidence to the geographical distances of the itineraries. It is therefore possible to conclude this measure was the Alexandrian stadion developed from the ancient Egyptian measures of the Remen, Cubit and Iteru. In the first paragraphs Strabo also states; “Still, when Hipparchus plots the celestial phenomena for several inhabited places, he uses, in addition, those intervals measured by Eratosthenes on the meridian through Meroe and Alexandria and the Borysthenes after saying that they deviate but slightly from the truth”. Thus it is possibly Strabo or Hipparchus who has conflated the meridians to a single line and we can reject previous research which infers that the meridian of Meroë is the same as the Borysthenes. We must use only the statement that follows the above list in ‘1.4.2’ where Strabo quotes Eratosthenes’ as saying that “beginning at Meroe and measuring on the meridian that runs through Meroe”. He does not amplify this to include other points on the meridian, which surely he would have, if had they been important markers. 1.4.7/line22 Alexandria to Rhodes sea route, straight line with course of Nile. Now we can construct a linear diagram of latitudinal distances, evaluate their veracity and indicate the errors of either transcription or mis-understanding. Eratosthenes has used certain parallels in his comparisons more than others; i.e. Meroe, Syene, Alexandria, Rhodes, Athens, Borysthenes and Thule. He has also, if Strabo’s figures are correct, altered distances by at least 100 or 500 stadia. The longitudinal measures are all obviously ‘rounded out’ units from itinerary measures. From the list, the most striking error is the distance given from Alexandria to the Hellespont, 8100 stadia. This is accurately 7000 stadia and would appear to be a sailing distance which has not been converted to a latitudinal measure. The misplacing of Byzantium and Rome is another example of an error, by the inversion of the 1500 stadia differential quoted. However, from the Equator we can construct the main latitudinal measures and compare their geographical positions which accord rather well with Eratosthenes’ (and Hipparchus) overall scheme. Using the details which can be deduced from ‘2.5.38 to 42’, we can infill the intermediate points and clarify just how much information Eratosthenes’ had gathered in c225BC. We can also, at this juncture, conclude the story-line of the measurement from Syene to Alexandria. If it followed the course of the Nile, as is clearly stated in ‘2.5.7’, and is given many times as 5000 stadia, and, from the Equator to Syene is 16800 stadia or 24 degrees, then, from the Equator to Alexandria is 21800 stadia. Alexandria is at 31.143 degrees north, (i.e. 21800/700,) and thus 7.143 or 7 1/7 degrees north of Syene. Therefore, we have the simple arithmetical sum of: 7 1/7 = 5000 stadia and thus 360/7.143 = 50.4 and 50.4 x 5000 equals 252000 stadia. Why was it necessary to add 2000 stadia to the figure of 250000 stadia when the simple mathematical calculation is so clearly identifiable? It is from Cleomedes13 that Eratosthenes’ derivation of the world circle is gleaned, by his stated use of the text of ’Measurement of the World’ (just as Strabo uses Eratosthenes’ Geographia) and thus we must question the precise figures attributed thereto. Was the 7 + 1/5th actually 7 + 1/7th as Eratosthenes’ figures appear to indicate? Was the 5000 stadia measure from Syene to Alexandria far easier to multiply out, as follows? Or thus, 360/7+1/7th = 2520/50 = 252/5 and then 252/5 x 5000 = 252 x 1000. Surely not! Would Eratosthenes, a mathematician of some note, not have realised that in carrying out the first equation (if in fact he did that work) and possibly arriving at 250 000, that by substituting 252 000, thus ensuring a 60 or 360 divisor, the angular difference could be calculated exactly and the seventh part would be noted within the figures for the degree at 700 stadia and the sixtieth part at 4200 stadia. From Cleomedes text it is hard to determine the veracity of the methodology. But we can conclude that the latitudinal measures taken by either the Skaphe or star sights have provided a rather remarkable set of accurate figures which Eratosthenes has translated into actual distance measures. The questions that require to be answered are: 1), can a Skaphe or larger gnomon, detect the difference between 7.142870 and 7.20 when they were originally ratio figures? In modern parlance the difference is 0.05714285 or 57 thousandths of a degree! 2), and, could the Skaphe really be that accurate? A large gnomon with graduations there-on to ensure the ratio measure (actually the tangent of the angle) was as accurate as possible, would appear to be the more likely instrument. But, has our use of a handheld calculator, capable of producing accuracy undreamt of in ancient times blinded us to simple written mathematics? The two calculations made above are so very simple for such an eminent mathematician as Eratosthenes. The use of the Gnomon or Skaphe and the ratios generated by the shadow, when converted as above to give Eratosthenes world measure of 700 stadia per degree has produced an acceptably accurate latitudinal scheme for the world. The difference between Eratosthenes’ measure of 252 000 x 0.1575Km or 39 690Km, compared to the geographical measure of 40 009Km Meridional, is negligible. It is in fact within 99.8 per-cent of reality and would be capable of use for general measures. That difference is 700or 705 stadia of 157.5 metres per latitudinal degree. The stadion, which is so disparaged by many researchers at 157.5 metres, comprises 420 Remen or 300 Royal Cubits of 525mm. The Aegyptians measured14 the world long before Greek mathematicians, and when Eratosthenes was in Alexandria, only some 80 years after the start of the Greek Ptolemaic era, most measurements would have still been in the ancient Aegyptian metrology. By using the stadion of 157.5 metres, each of the measures of Eratosthenes’, Hipparchus and Strabo can be shown to equate to geographical distance measures of today. The positioning of the Tropics at 24N equating to the then perceived angle of the ecliptic, produces a constant picture of the world which enables later cosmographers or cartographers to build upon the work of Eratosthenes’ producing ever more accurate maps. That Eratosthenes knew there was land south of the equator, as an extension of Libya/Africa is indicated by Strabo’s text. Thus it is perhaps one reason why the length of the world, for no apparent reason that we are told other than “natural balance”, Eratosthenes’ has increased from 73 800 stadia by adding 2000 stadia at each end! Should this southern land prove habitable, and the voyage of Hanno15 perhaps indicated this, it is certainly a way of preparing the ground for future expansion in the calculated length. What other reason is there for adding 2000 stadia past the capes of Iberia, into the wild Atlantic and to nowhere? The bulge of Libya/Africa is at 17.5W or 8.15 degrees west of the capes of Iberia. The Canary Islands are at 14.35W or 5 degrees from those capes, but, 2000 stadia converts to3.5 degrees at 36N, and this would indicate Cape Juby, Tarfaya, the African mainland opposite the Canary Islands. If we study Strabo’s text for Libya/Africa, as has been shown, he indicates a western bulge at Coteis/Cape Rhir, which could be the additional measure. We must be careful when analysing the information that Strabo has bequeathed us, particularly when it is a synthesis of many authors’ texts. But, had it not been for Strabo the text of Eratosthenes’ would, in all probability, have been consigned to the dustbin of time. Even though there is the work of Hipparchus to utilise, we find the most compelling information in Strabo’s text. The world of Eratosthenes, based upon a stadion of 157.5 metres is only a miniscule error from the actuality of our Meridional world. Eratosthenes was 99.8 percent correct in his calculation made c225BC. His works were so influential that they were both lauded and criticised, but, also no doubt copied and mis-copied in the intervening 200 years before Strabo commenced his text for the 17 books of his ‘Geographia’. However, the work is that of Eratosthenes’, andis of paramount importance tohistorians and cartographers,and, regardless of the historical comments, he is worthy of being known as Alpha. The author is appreciative of the assistance given by an un-named reviewer, who had only a first draft, cut and paste text to work with: and, to David J Leigh for reading a near final draft, and making editorial comments. There is also the general help, freely given, by Dr Mike J Smith, when the need arose. Thank you. 3) ibid, O. C. D. Strabo, page 1447. 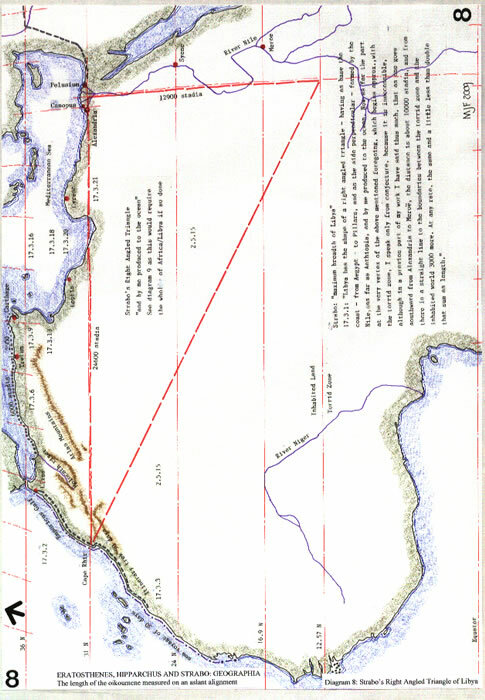 Rawlins, D. R.(1982), Methods for measuring the Earth’s size by determining the curvature of the Sea, and, Racking the Stade for Eratosthenes, appendices to The Eratosthenes-Strabo Nile Map. Is it the earliest surviving instance of spherical cartography? Did it supply the 5000 stadia arc for Eratosthenes experiment? Archive for History of Exact Sciences, v26, 211-219, 1982. 5) Heron of Alexandria quoted in Dutka, J. (1993) Eratosthenes measurement of the world reconsidered. Arch Hist Exact Sci, v 46; pp 55-66, see p63. 7) Diller, Aubrey. (1948), “The ancient measurement of the Earth”, ISIS, volume XL pp 6-9.